Find out how well your website performs. SEO analysis and suggestions to help your website rank higher and perform better. Would you like to find out if your website is performing at its best? 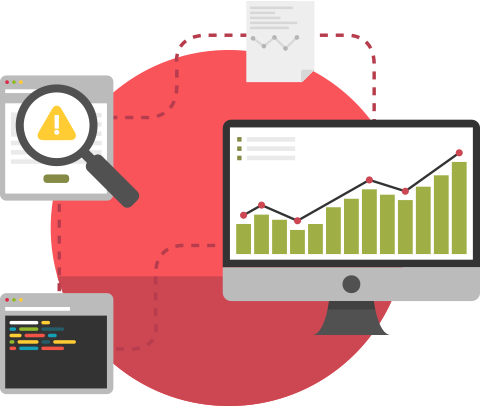 SEO audit will help you find out how well your website performs and help you identify the parameters that are relatively easy to fix, as well as those that require more work in order to achieve optimal performance. Our team has been successfully realizing digital marketing projects since 2007 and we are the first agency in Latvia that offers SEO optimization services. We offer our knowledge and experience to carry out a SEO audit for your website. We will analyze your website’s performance, based on more than a hundred SEO parameters, and perform keyword reaserch to find out if your website is optimized for the most appropriate and most searched-for keywords. We will inform you about the parameters that work well and those that require optimization. Based on our findings, we will provide you with a detailed report about your websites performance and offer suggestions for improvements. Does your website require SEO optimization? If your website or specific web pages require optimization, additionally to SEO audit, we can also perform off-page SEO and on-page SEO optimization in accordance to a strategy that will be developed specifically for your needs. In case your website is already optimized, but you are looking to add new products or services, we can help you with unique content writing in compliance with all the SEO optimization guidelines, so that your web pages rank in the first positions and can be easily found using search engines. No matter what your SEO needs may be, make sure they have been carried out by professionals – contact us and receive an offer designed for your specific requirements. SEO optimization – Additionally to the audit, we offer full-scope SEO optimization in order to improve your website's performance and search engine rankings.